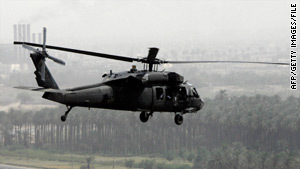 The United States is going to sell 60 Black Hawk helicopters, totaling $3.1 billion, to Taiwan. State Department says arms sales guarantee security and stability "across Taiwan strait"
Washington (CNN) -- China said Saturday it had suspended military exchanges with the United States over Washington's $6.4-billion arms deal with Taiwan, the territory that Beijing claims as its own. China's Defense Ministry said the decision to halt visits between the Chinese and U.S. armed forces was made "in consideration of the serious harm and impacts on Sino-U.S. military relations" brought about by the arms deal, according to a report on the state-run Xinhua news agency. Xinhua did not immediately provide further details on the visits. "China will make further judgments as appropriate," the agency reported. China had already complained to the United States about the deal, announced Friday by the Obama administration. Chinese Vice Foreign Minister He Yafei called it a "rude interference in China's internal affairs, severely endangering China's national security" and said China expressed its "strong indignation." The arms sale includes 60 Black Hawk helicopters, totaling $3.1 billion; 114 advanced Patriot air defense missiles; a pair of Osprey mine-hunting ships; and dozens of advanced communications systems. The deal with Taiwan -- which neither China nor the United States recognizes as a sovereign nation -- does not include F-16 fighter jets, which China has vehemently opposed. The State Department described the latest round of arms sales to Taiwan as a way to guarantee security and stability, despite China's objections. "This is a clear demonstration of the commitment this administration has to provide Taiwan with defensive weapons it needs and as provided for in the Taiwan Relations Act," State Department spokesman P.J. Crowley said Friday. He said the action is consistent with Washington's "one-China" policy and will help maintain security and stability across the Taiwan Strait. The arms sales come as the United States is hoping to persuade China to sign on to harsher sanctions against Iran and just after Secretary of State Hillary Clinton criticized China for its policies relating to the Internet. Crowley would not speak directly about the timing of the announcement of the sales, and about the fact that the arms package does not include F-16s. A senior U.S. official said later that the United States expected Chinese criticism of the arms deal, but does not expect permanent damage. The official said he believed Clinton had discussed the sale in London with her Chinese counterpart on the sidelines of Thursday's international conference on Afghanistan. "This relationship between the United States and China is broad, it's deep. There are a large number of issues. We don't see eye to eye with them and we have to have and do have the ability to speak honestly," the official said. The arms deal is the latest chapter in a decades-long uneasy standoff. China claims Taiwan is its own territory and has threatened to invade if Taiwan ever declares independence. The United States has said it will defend Taiwan if China ever attacks. The government in Taiwan began as the remnant of the government that ruled over mainland China until a Communist insurrection proved victorious in 1949. With the Communist takeover of mainland China, the losing faction fled to the island of Taiwan. Taiwan is formally known as the Republic of China, while Communist China's official name is People's Republic of China. Many Western nations and the United Nations recognized Taiwan as the legitimate Chinese government until the 1970s.